Babies spend most of their day sleeping, pooping, being precious and eating. The latter of which can be quite a messy affair that translates to heaps of laundry. 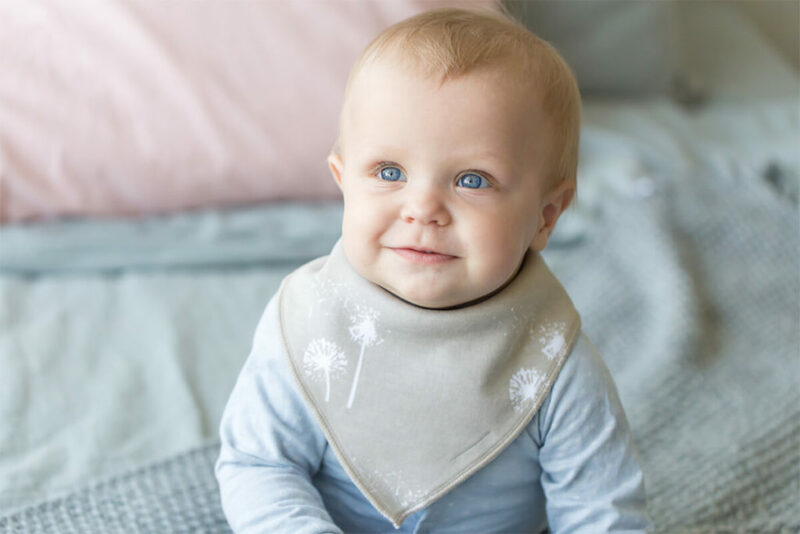 A good quality bib will keep the little ones and their clothes clean as they breastfeed, take formula, drool and dribble as they start baby teething, and when eating solid food. An absorbent bib will soak up everything and help you avoid frequently changing outfits. A waterproof bib prevents stains and is easily cleaned. Another benefit of bibs is that they serve to protect your child’s fragile skin. Wet fabric left on the skin can lead to rashes. 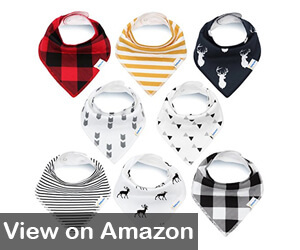 There are many different types of bibs in an assortment of sizes, shapes and styles, and the add-ons are just as varied. Some come with convenient attached pockets for added protection from spills and drips. Others have sleeves to provide increased coverage. We present you with our top picks that we have thoroughly researched and tested to keep your baby tidy and make the feeding process a smoother and more pleasant experience. 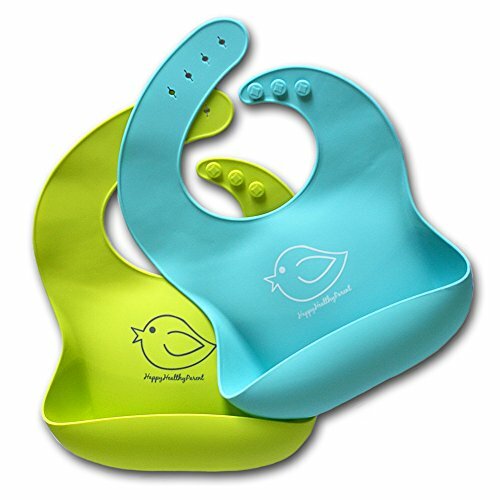 The Happy Healthy Parent Silicone Bib is available in a pack of two that comes in a paired combination of colors; lime green and turquoise, red and blue, orange and gray, and pink and purple. It is made from food grade silicone which is 100% waterproof and is free from BPA, lead and phthalate. It features a wide silicone pocket and has closure with snaps in the back. The neckband has buttons and slits that can be used to adjust the size to fit the baby. The bib can be safely washed in the dishwasher.This silicone bib is suitable for children aged six months to six years. It is very easy to clean because it is made from silicone, thus saving you time and energy. You can easily baby wipe it off, rinse it and use it again without waiting for it to dry. It is also resistant to stains. The bib is easy to store and carry around because the thin silicone material is flexible and it does not take up much space. It has a pocket that traps food crumbs so they don’t spill on clothes. The neckband can be easily adjusted to accommodate babies at various stages of development, ranging from six months to six years old. This will save you money because your baby will take time to outgrow it. The closure is fastened securely and it remains in position even if the baby tries to pull it. 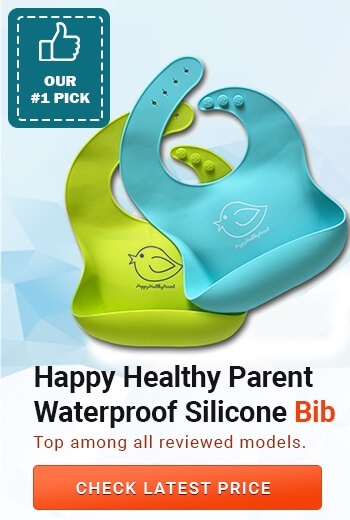 The Happy Healthy Parent Silicone Bib comes with a lifetime money back guarantee to cover you if you ever feel the need to replace it. Who wouldn’t love that? Since it is made of silicone, it is not absorbent. This makes it less suitable for babies who are drooling and dribbling. The pocket can be distracting for some babies due to its width. Charis Kid Baby Teething Bib with Snaps comes in a pack of 10. It features a breathable and waterproof layer in the middle enclosed within two layers of 100% terry cotton fabric which is absorbent. The bibs are available in an array of colors for multiple options. They consist of three snap buttons that are adjustable for fitting. 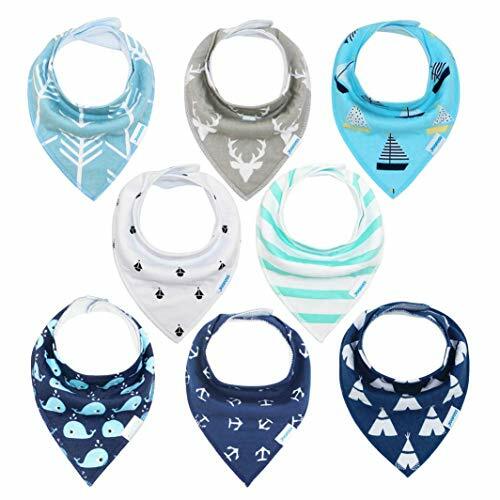 Use cold water to wash them so that the colors do not bleed and then hang it to dry to avoid ruining the waterproof layer.This teething bib is suitable for newborn infants to three-year-olds. The three layers of protection make it soft yet super absorbent so no drool or liquid can seep through. It is 100% leak-proof. The wide variety of colors make them ideal for babies of all genders. The neckband can be easily adjusted to accommodate babies up to three years old. The snap closure is safe and you do not have to worry about it scratching the skin. It provides decent coverage because it is longer than regular bibs. The bib shrinks when put in the dryer. Should only be hung to dry. 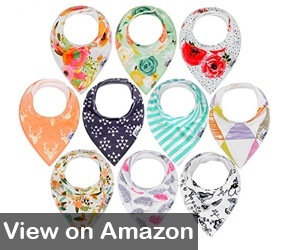 Vuminbox Baby Bandana Drool Bib comes in a pack of six trendy and stylish patterned bibs. The front part of the bib is made of 100% organic cotton while the back is made of polyester fleece. It features two adjustable nickel-free snaps which are made from brass. 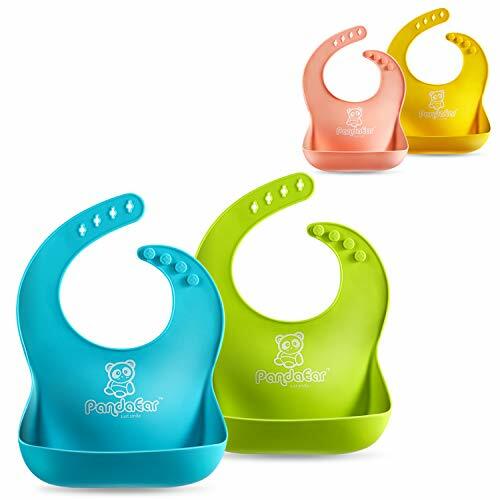 A removable food grade silicone teething ring which can be used as a toy is attached at the end of the bib. You can clean it in a dishwasher and disinfect it at high temperature. This bib is suitable for toddlers aged three to 24 months. The absorbent cotton and fleece polyester makes it ideal for dribble and drool clean-up and keeps the baby dry. It is also very comfortable on the skin. It comes with a teething ring that is made from food grade silicone so your toddler can have an extra toy to play with safely. You can also add other toys to it. The teether is removable for easy cleaning. The bibs double up as a great accessory. They have vibrant and stylish patterns which add a pop of color and liven baby’s outfit. The adjustable snaps increase the bibs longevity since your toddler can continue wearing them as they grow. The bib is prone to wrinkles and shrinks when machine-washed. The snaps can easily come off. 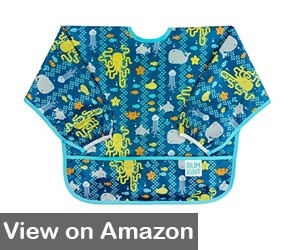 The Bumkins Waterproof Sleeved Bib is made of 100% polyester that can easily be wiped off to clean. The lightweight material is resistant to water, stains and odors. The front features a pocket at the bottom while the back has closure that uses ties. It also includes sleeves with elastic cuffs. You can clean it safely with a washing machine and hang it out to dry. This bib is suitable for babies aged 6 months to two years. The polyester material is impermeable, stain resistant and is easy to clean. It features sleeves which protect the arms and clothes. These bibs are more secure and harder for the baby to remove because the closure uses ties instead of Velcro. Ties also give you several adjustment options. The attached pocket at the front decreases spillage and crumbs from food. It drapes over the front torso and the arms for maximum protection of the upper body. The front pocket sewn in segments limit its functionality and make it harder to remove the trapped food and liquids. 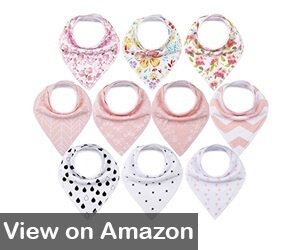 The Ana Baby Bandana Drool Bib is available in a set of 10 cute and adorable patterns. The material is made from cotton on the front and polyester fleece on the back. The double layer makes the bib more absorbent to prevent any drool or liquid from permeating through to the skin and clothes. The bib features two nickel-free snaps that are used to fasten the bib around the neck so that the toddler cannot remove it. The snaps can be adjusted for a better fitting. Avoid using a dryer because it can make the colors fade.Unsatisfied customers are guaranteed a full refund. This bib is suitable for newborn infants and toddlers aged up to two years. The soft baby bib is made of fleece which is comfortable and gentle to avoid bruising the fragile skin. It is also hypoallergenic to prevent allergies from skin that is prone to allergies. The colors fade if you use a drier. This bib should be hang out to dry after washing. KiddyStar Bandana Baby Bib comes in a set of eight unisex bibs with various prints and patterns. It is made of 100% cotton at the front and a polyester fleece at the back. It consists of nickel-free snap closures that are fastened around the baby’s neck to secure the bib. It is available in three neck sizes. You can safely clean it with a washing machine and hang it out to dry. As with other cotton/polyester bibs, using a dryer can fade the colors. The dual protection provided by the cotton front and polyester back which keeps the baby’s skin dry and is soft and comfortable. They are lightweight and can be worn for a long period without discomfort or hindering movement. The different patterns make the bibs both functional and stylish and can be used to accessorize the rest of the baby’s outfit. The varied prints also provide more options for babies of all genders. The nickel-free snaps are hypoallergenic and can be safely used on sensitive skin without worrying about allergies. The bib shape is relatively more narrow which can lead to less coverage with heavy droolers. 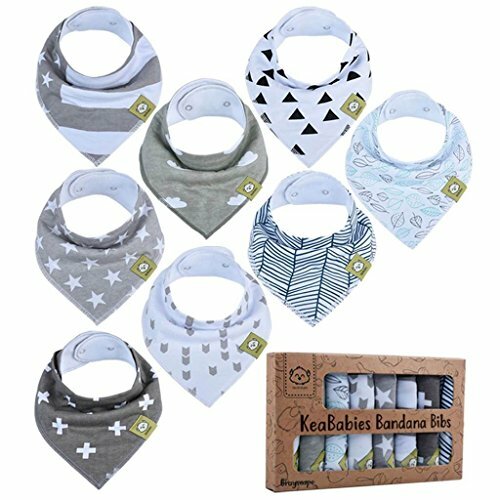 Matimati Baby Bandana Bib comes in a set of eight playfully patterned bibs of arrows and triangles that suit babies of both sexes. The front part is made from 100% organic cotton and the back fleece is made from polyester. It features two nickel-free snaps that can be easily adjusted to various sizes to accommodate babies at various stages of development (Source). The material is pretty thick and very absorbent. You can use a washing machine to clean it but avoid dryers to prevent fading of the fabric colors. You should hang it out to dry instead. This bib is suitable for babies aged 3 to 24 months. The neutral designs are unisex and suitable for babies of all genders. The thick material makes them extremely absorbent and prevents spillage and leakage. A portion of each sale made by Matimati is donated to Chain Reaction which fights human trafficking. 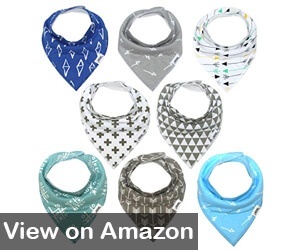 Due to its thickness and bandana shape, it can be quite chunky and bunch up under the chin. 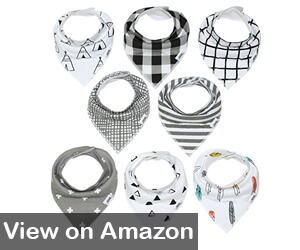 Matimati Monochrome Baby Bandana Drool Bib is available in an assortment of eight monochrome-colored bibs. The front part is made from 100% organic cotton and the back fleece is made from polyester. It features two nickel-free snaps that allow adjustment as the baby grows. These snaps secure the bib at the back of the baby’s neck. The material is pretty thick and very absorbent.It is machine washable but using a dryer can cause the fabric colors to fade. You should hang it out to dry instead. The monochrome colors are versatile enough to pair up with most outfits as an accessory. The thick material is absorbent yet still soft and safe for sensitive skin that is susceptible to rashes and other allergies. Fabric balling can form on the back layer of fleece. 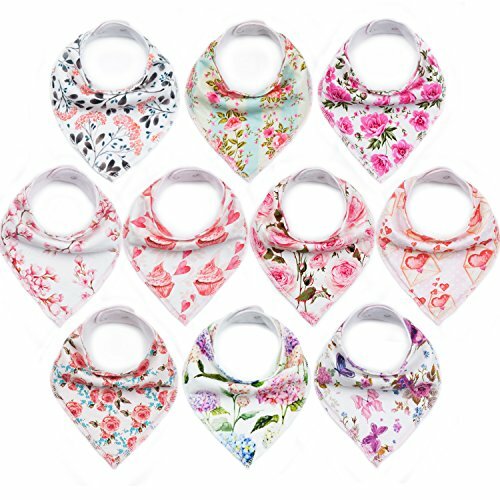 Upsimples Bandana Bib comes in packs that consist of a set of 10 bibs of different colorful designs. The front part of the bib is made from cotton and the back is from polyester. It has 2 sets of nickel-free metal snaps with three adjustable sizes. It can be cleaned with a washing machine on a gentle and dried at the lowest drier setting. Hanging it out to dry is a better alternative. Improper cleaning process can alter the shape and size of the bib and cause the color to fade. This bib is suitable for newborns and babies up to the age of three years. The cute baby girl bibs come in a variety of pretty and trendy designs that complement your daughter’s outfit. Its thickness makes it very effective in soaking up all drool and dribble and keeping the skin dry. The snaps secure the bib in place so that the baby cannot remove it. They can also be easily adjusted to fit the neck and also accommodate her growth. The added layer is absorbent enough to keep both the baby’s skin and clothes immaculate and dry. Luvable Friends 10-Piece, Chevron and Solids is made with cotton and polyester. It uses Velcro fasteners to hold the bib at the back of the neck. Make sure you fasten the Velcro before washing it to prevent it sticking to other clothes. Bib is machine washable. This bib is suitable for newborns and babies up to the age of nine months. Terry cloth fabric is light and thin so the baby does not get uncomfortable when wearing it. The Velcro fastening keeps the bib in place. It is ideal for babies that have already been weaned. It is pretty thin so you might need to change it often to avoid leaking and spillage if your baby is drooling or teething. Babies who are still dribbling will saturate the bib quickly. Teething bibs are best for toddlers whose teeth have started to come in because with new teeth comes excess saliva. 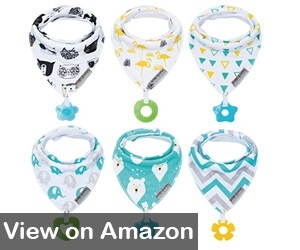 These bibs are small in size and can be comfortably worn throughout the day because they do not get in the baby’s way. They are positioned higher on the neck and tied at the back. Their high position on the neck provides better absorption than ordinary bibs. Some come in the shape of cute bandanas that can be easily matched with the rest of the baby’s outfit. Due to their small size, they might not provide enough coverage because the lower part is exposed. They are best for older babies who can sit on their own. These bibs are often made of silicon which is super easy to wipe clean. A handy pocket located at the bottom traps any food that may fall. The best feature of this style bib is that, when age appropriate, your child will be able to feed itself snacks using the pocket as a bowl. Long-sleeved bibs are best for babies six months and up. They provide full coverage of the upper body, minus the head, of course! These types of bibs also make them ideal smocks for arts and crafts activities because the clothes are protected from paint and crayons. The fabric is coated with plastic and is frequently toted as water-proof. The typical closure is attached with ties or Velcro fasteners. Some hand openings are elasticated at the wrists which your baby may or may not be bothered by. Disposable bibs are ideal when traveling or when you are out and about. 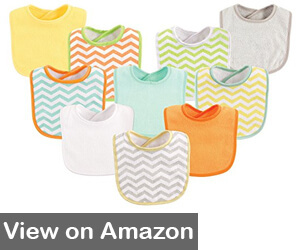 Commonly sold in multi-packs, these bibs are great in a pinch. They are absorbent and leak-proof. Many even feature an attached pocket to catch drips and crumbs. Adhesive tabs are included and are easily adjusted to keep bibs in place. 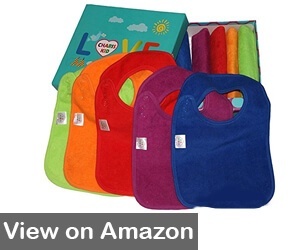 Regular toweling bibs are popular because they are inexpensive and highly absorbent. They are available in small and big sizes that are usually packaged in multipacks. Their simplicity makes them easy to store and carry around. You can fasten them with ties, snap closure buttons, Velcro or through a stretchy hole that can be pulled over the head. One potential downside is that they easily stain. With all the options available, it can be overwhelming to determine the best bib for your child. Below is what to look out for when choosing the best baby bib (Source). The ideal bib consists of absorbent material that can soak up drool, other liquids and foods. Ideal bibs prevent clothes from becoming soiled and causing skin irritation. It can also be made of waterproof and leak-proof plastic to eliminate the possibility of any mess seeping onto clothing. Babies feed frequently and are guaranteed to create continual messes especially when learning to self-feed. An easy to clean bib will save you money, time and energy. Bibs made from plastic and silicone can either be simply wiped off or cleaned in a dishwasher. Choosing a fabric that does not stain easily will save you energy and money in the long run. Bibs come in various sizes and styles. For instance, dribble bibs tend to cover smaller areas and are therefore not suitable for older babies. As babies grow, their bib style and needs will change. Older children need bigger bibs that can protect them as they become more adventurous and develop other pursuits like drawing and painting. Older babies also need bibs that can fasten more securely, so they are not able to remove them. Due to their drooling, toddlers have bibs on most of the time, so it is essential for the bib to be comfortable throughout the day. The bib should be big enough to provide adequate protection but small enough so it does not get in the way or hinder their movement. The fabric should be soft and non-scratchy to avoid irritation. A strap that can be easily adjusted will increase the longevity of the bib and save you money. It will also be comfortable to wear. Choose a bib that can be fastened securely without leaving any loose straps that can get tangled up with other things and topple the baby. Bibs with Velcro, snap and press buttons are the safest options. We do not recommend leaving a child unattended while they’re wearing a bib. Babies need a lot of essentials, from diapers, feeding bottles to frequent change of outfits. All these needs can limit space for other essentials. The bib needs to be compact and easy to carry so it can fit into the baby’s changing bag. A tight bib can be dangerous for obvious reasons, and the baby can remove a loose bib or get it caught up with other things. Get the right size and fit and ensure it is fastened correctly. Bibs are as varied as their features. Look out for bibs that have added features such as fasteners, pockets, trays, plastic covering and snaps for more comfort and an extra layer of protection. The most important function of a bib is to protect your baby’s skin and clothes safely and comfortably. This should be your guiding principle when choosing a baby bib. Different materials work in different ways; some can be easily wiped off and others have to be washed under certain condition. Some use Velcro for fastening while others have ties and snaps. Some have pockets and extra layers for added protection. Their functions are just as varied. Confirm the specific task it is meant for before buying one. For instance, the best baby bibs for drooling are extremely absorbent to soak in the dribble and keep the skin dry. Bibs meant for regular feeding do not need to be super absorbent, but they should be easy to clean. Our baby bib guide will help you avoid messy mealtimes, protect your little one and save you time, money and energy.